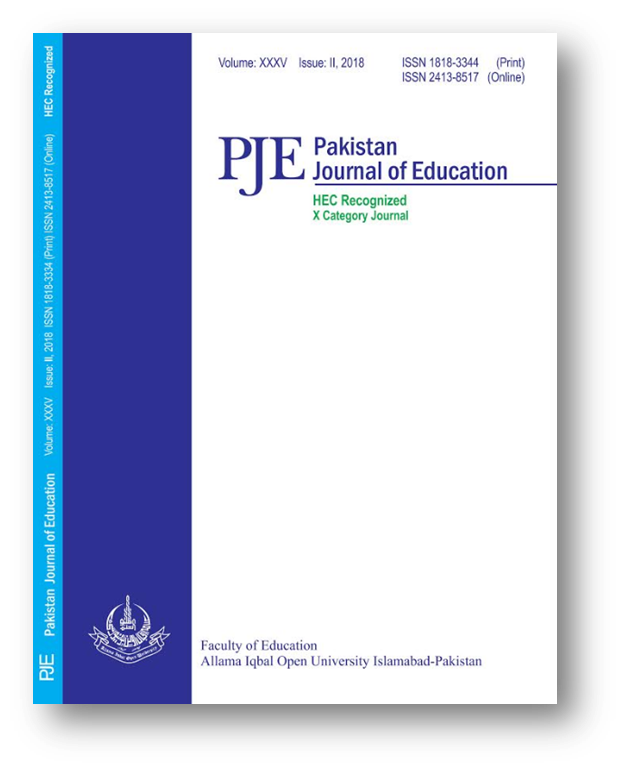 Pakistan Journal of Distance Education was renamed as Pakistan Journal of Education (PJE) in year 2000 to widen its scope. Handwriting, learning, legibility, visual motor integration (VMI). Issue No. 1 of volume 34 has been published. academic environment academic personnel. assessment Assessment Skills career classroom environment communication conflict resolution cooperative cooperative learning demonstration educational systems Experimental Research Handwriting higher education improving research instructional strategy learning legibility Mathematical Word Problems medium of instruction Metacognitive Instruction modern teaching trends Nature of conflict performance Physical environment professional development Prospects and challenges Reflection reflective practice Self-Assessment social-studies teachers social sites Socio-economic status strategy management Stress teacher education teaching teaching occupational respect teaching profession attitude Traditional Method Training needs undergraduate research virtual arts visual motor integration (VMI). © 2019 Pakistan Journal of Education.